would also collect the things associated with doors. for maximum design impact, of course! How cool is that display?!?! You always do the most fabulous arrangements....I always search thoroughly through your post to see your groupings. BEAUTIFUL!! I have been waiting for you to post all morning...you have been such an inspiration to me. I love everything you do and decorate. Yesterday, I spray painted a bird bath in honor of You! It turned out well and now is in my bathroom I even mentioned you on my posting! Great vignettes! I love old skeleton keys. I love keys. I don't know why, but they are one of my favorites. I posted about some large keys I have in my hallway a while back. Not real, but still the shape. That is an amazing collection! You just have such a way of doing things! And I love what you do with doors! 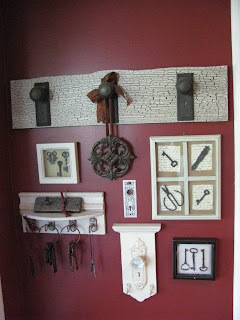 Just so neat to see what you share with your friends...How cool with the skelton keys and door knobs. Currently cleaning the drool up off of my desk after sitting with my jaw-dropped admiring the lovliness of this post. Thank you Joy...I am glad you liked my cloche. Enjoy yours!! OH THAT IS JUST BRILLIANT! I have some old skeleton keys and you've given me some ideas here! I swear everytime I come here my brain goes into overdrive getting ideas from you! Thanks for sharing your talents with us! Wow! I love your key collection! You have so many cool ones. Love it! Love your collection! I have some old door knobs an I love old keys! Where do you find the best price for spray paint? or do you know where to get it for super cheap? *sigh* I want to be you. This looks great, what a wonderful display. I love it. Love old keys! What a gorgeous display! Just love it! 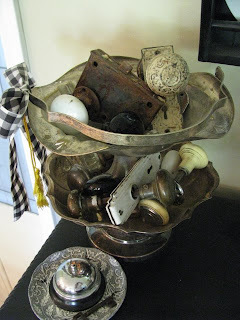 I have a bunch of old door knobs from our home that maybe I could find a use for! I love your bookshelf with all your beautiful things. And how fun, the hurricane with all the knobs. I love that. It's a look that you would find in a model home and think,"Hmmm, why didn't I think of that?" Once again you have done a beautiful job with your decorating. I love your fall decorations! Hi Joy! That collection is simply a-door-able! Hehe, I couldn't resist. But truly, it looks great. 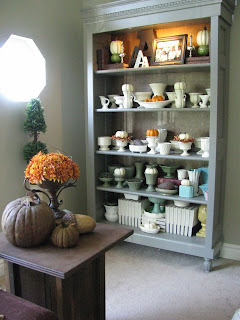 I totally agree that collections are best displayed when grouped together! I love your collection of keys and doorknobs and anything else door related! You have an artistic talent...love your ideas. oh and yeah I'd love to go night time junkin with you, one of the best things I've done for a long time, roflmao!!! Absolutely stunning! I have always loved glass doorknobs and skeleton keys! I think the Nancy Drew fan in my is behind the skeleton key thing! Your displays are fabulous. You have such good taste, I love the way you decorate. Love your ideas! Just wonderful! What a great collection. I love your mantel grouping especially the frame picture. I really love that old bookshelf! It looks awesome...I love old door stuff myself..especially old keys! Cute! Gosh, I LOVE this!! I love old doors, just bought one to re-furbish, bought the old hardware for it, too! So this post is just right up my alley. I'll be blogging about it soon! Wow Joy, you are pretty dang amazing. I've realized that my little crafts just need to be taken to the next level. You sure are inspiring. I put another "L" up yesterday. Hope you like it.